Pricing is by far the most powerful profit lever that managers can influence. Yet few companies approach pricing in a way that fully capitalizes on its value. This Second Edition, a major revision and extension of the first book, shows you what it takes to achieve the price advantage in today's competitive and complex business environments. Based on in-depth, first-hand experience with thousands of companies, this book provides managers with a pragmatic guide through the maze of pricing issues. It reinforces why pricing excellence is more critical than ever today and then explains state-of-the-art approaches to analyzing and improving your own pricing strategy and execution. 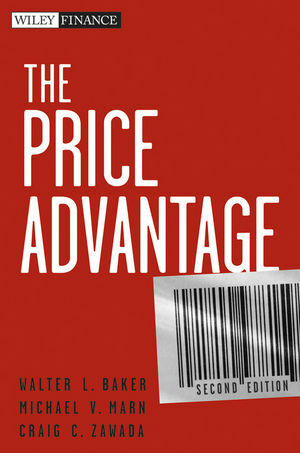 Engaging and informative, the Second Edition of The Price Advantage will put this essential discipline in perspective. WALTER L. BAKER is a partner in the Atlanta office of the international consulting firm of McKinsey & Company. Since joining McKinsey in 1998, he has worked with clients across multiple industries in the areas of pricing, sales, marketing, and strategy. With particular focus on the technology and industrial sectors, he has authored articles on pricing in CMO magazine, the McKinsey Quarterly, and the Harvard Business Review. MICHAEL V. MARN is a partner in the Cleveland office of McKinsey & Company. He joined McKinsey in 1977 and has developed some of the most widely used analytic approaches for identifying and capturing opportunities in pricing. He has written articles on pricing that have appeared in publications including the Wall Street Journal, the New York Times, and the Harvard Business Review. CRAIG C. ZAWADA is a partner in the Calgary office of McKinsey & Company. Since joining McKinsey in 1997, he has worked with companies across multiple industries, helping them to identify and capture improvements in pricing. He is widely published in the area of pricing strategy, with articles appearing in the Harvard Business Review, Mergers & Acquisitions, and the McKinsey Quarterly. The Power of 1 Percent. The Nobility of Pricing Excellence. Why the Price Advantage Is So Rare. CHAPTER 2: Components of Pricing Excellence. Applying to Your Company—Pinpointing the Opportunity. PART TWO: Exploring the Levels. The Soundco Radio Company Case. Pocket Margin Waterfall and Band. Making Moves on the Value Map. Putting Customers on the Value Map. Profiting from Better Price Predictions. Planning for an Expected Price Change. Maintaining Optimal Production and Capacity. Influencing the Elements of Pricing Conduct. Processes—What Are the Most Critical Types of Pricing Decisions for Your Business? Organization—Who Is Running the Pricing Profit Center? Performance Management—How Should We Recognize and Reward Pricing Performance? Systems and Tools—No Magic Bullet Exists. A Temporary Window of Opportunity. Tremendous Opportunities at Each Pricing Level. Why Price Wars Should Be Avoided. What Really Causes Price Wars. Staying Out of Price Wars. Getting Out of Price Wars. When a Price War Might Make Sense. PART FOUR: Expanding the Boundaries. CHAPTER 9: Legal Degrees of Freedom. Pricing Decisions That Raise Red Flags. Minimizing Risks While Meeting Pricing Objectives. What Makes Lifecycle Pricing Tough. The Three Phases of Product Lifecycle Pricing. Sustaining Returns Across the Lifecycle. Price Architecture Based on Supplier Role. Section Two: High-Count Product Lines. Section Three: Distributed Sales Models. Section Two: Tiered Products and Services. Section Four: "Razor/Razor Blades" Offerings. CHAPTER 14: Software and Information Products. Unique Characteristics That Impact Pricing. Exploring the Elements of Pricing. PART SIX: Making Change Happen. Designing a Clear Change Program. CHAPTER 16: The Monnarch Battery Case. Capturing the Monnarch Pricing Opportunity. APPENDIX 1: Pocket Price and Pocket Margin Waterfalls. APPENDIX 3: List of Acronyms and Abbreviations. APPENDIX 4: About the Web-Based Tool: Periscope.